Overlooking Quoddy Narrows near the Bay of Fundy at Quoddy Head State Park, off Route 189 from Route 1. Ironically West Quoddy Head Lighthouse, situated on forty foot high cliffs, overlooking Quoddy Narrows near the Bay of Fundy, stands on the easternmost point of the United States, although it is west of East Quoddy Head Light (also referred to as Head Harbor Light) located a few miles away on Campobello Island, in Canada. It is one of the oldest lighthouses in Maine. 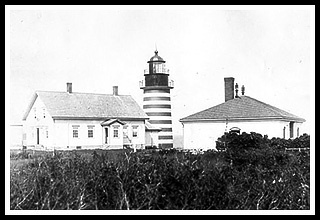 In 1806, President Thomas Jefferson was convinced of the need for a lighthouse and West Quoddy Head was completed in 1808 with Thomas Dexter as its first keeper. Dexter complained to the Department of Treasury that the soil wasn’t rich enough to maintain a garden to feed his family and had to travel for his supplies, so they increased his salary from $250 to $300 a year. To warn ships of the frequent fog banks that were created from the Bay of Fundy, a 500-pound fog bell was installed at West Quoddy Head light in 1820. It was one of the nation’s first fog bells. The keeper at the time complained about the extra work, and asked for a pay raise. After seven years of petitioning his employers, he got an extra $70 a year for the extra duties of having to constantly ring it in the frequent foggy weather. With mariners having problems hearing the bell far enough away from the rocks, the station tried a high-pitched bell, then a 1,500-pound deeper sounding bell, and then a 14-foot triangular steel bar. None were proved satisfactory. Today West Quoddy Head has a powerful foghorn activated by a robotic fog-sensing device. West Quoddy Head Lighthouse was rebuilt in 1831 due to its original poor construction, then in 1857 the tower was completely reconstructed and, as it stands today, rises 85-feet above the water. Its distinctive red-and-white stripes offer daytime mariners better visibility, especially in winter months. On a thick foggy day on September 22, 1915, the three-masted schooner Lanie Cobb was heading to Calais, Maine, from New York with a cargo of coal when it ran aground on the ledges near the lighthouse and broke in two. The crewmembers were immediately rescued without any fatalities. The keepers’ children had a 2-mile walk to school in Lubec. In the 1920’s, the children of Keeper Marston found lumber washed ashore and built a little play hut in the woods for local children to gather. The structure was still standing into the 1990’s. The lighthouse automated in 1988 with Malcolm Rouse as its last Keeper. It recently had restoration work done completed in 2008. 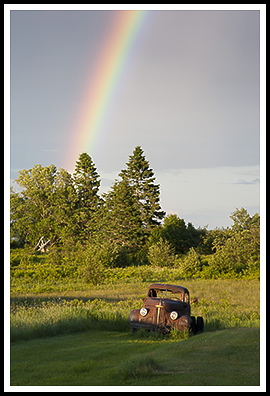 Lubec is located on the banks of the St. Croix River near the United States/Canada border. This former shipbuilding and sardine-packing town is the first town in the U.S. to see the sunrise. It has no shopping malls, fast food restaurants, of stoplights, only rugged natural beauty that hasn’t changed. This is truly a place to disconnect and enjoy the outdoors. The community consists of artists, a few specialty shops, and fishermen. The views at West Quoddy Head lighthouse are quite stunning with Canada’s Grand Manan Island in front of you as you stand over cliffs to the sea. The tower is closed, but visitors are welcome to enjoy the lighthouse grounds and explore the Visitor Center and Museum run by the West Quoddy Head Light Keepers' Association. Take a walk along the rocky beach below. Some parts of the park have patches of actual arctic tundra, which you would find much further up north. In early summer purple lupine flowers are everywhere and biking is a great way to go exploring and take in this spectacular area. There are also whale watching, deep sea fishing, and lighthouse tours out of Lubec as well. Take some time and hike through the Quoddy State Park's miles of nature trails, over scenic coastal terrain. Many of these trails are used on what is known as the Quoddy Loop Trail System, which includes trails across the border onto Campobello Island in Canada. If you have the time, cross the border into Canada and explore Roosevelt Park on Campobello Island. There you'll find, Mulholland Point Lighthouse with plenty of walking trails. 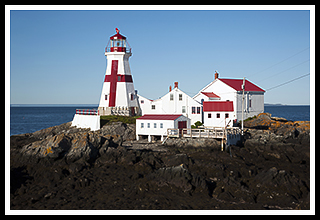 Then, following a right after Roosevelt's cottage (15 Miles), you'll enjoy the stunning views of Head Harbor (East Quoddy Head) Lighthouse with its giant red cross painted on its tower. If you time it right, at low tide you can walk over to the lighthouse, but be wary that when the tide comes in, get off the island quickly as it has some of the fastest accumulation of water and highest tides within a short period of time. Its high tides can run as high as 50 feet. You can enjoy all kinds of relaxing activities on Grand Manan Island in Canada as well. There are also 9 more lighthouses around this island and surrounding islands. From US Route 1 take Route 189 at Whiting and head towards the town of Lubec near the Canadian border. After about ten miles, turn right onto the road to Quoddy Head State Park. Follow this road for about five miles to the parking lot by the lighthouse. You're at the eastern most point in the United States with some incredible views of cliffs and rocky shores. You'll also see Canada's glorious Grand Manan Island. Cruises mentioned below offer many types of cruises. 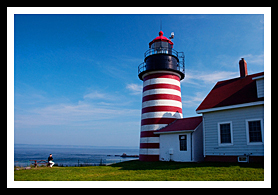 Both pass by West Quoddy Head Lighthouse during lighthouse tours, and may pass by the light as part of charters, narrated wildlife and historic tours, whale watching adventures, fishing tours, and other types of excursions. Own the Inn at the Waterfront, and offer whale watching and lighthouse tours. Offers whale watching on a 25' Northern Bay lobster boat and may pass by the Lubec lighthouses. 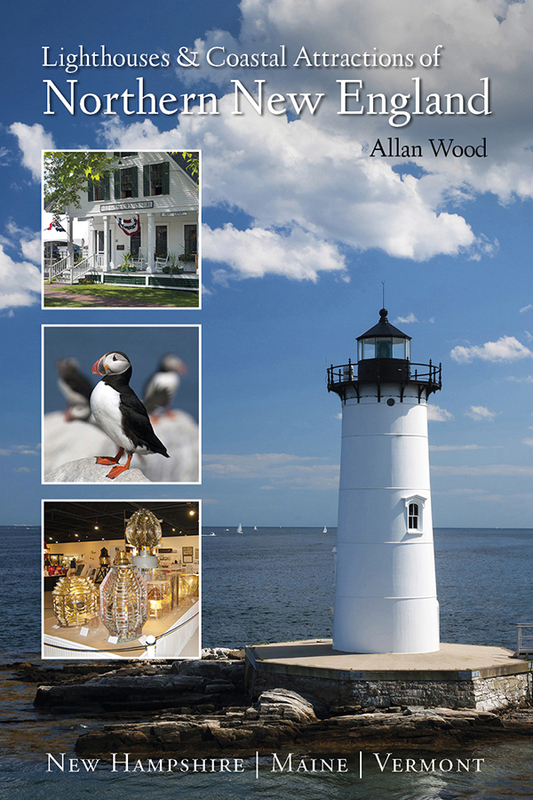 My 300-page book (with over 360 images), Lighthouses and Coastal Attractions of Northern New England: New Hampshire, Maine, and Vermont, provides human interest stories from each of the 76 lighthouses from these northern states, along with plenty of coastal attractions and tours near each beacon, and contact info to plan your special vacation.